Thinking of replacing your roof this season? This project is a big step —not to mention a significant investment— that most homeowners would have to face at least once in their lives. Whether you’re planning to resell your house or you simply want to enhance it’s look, replacing your old roof will surely do wonders to your home’s curb appeal. Apart from the aesthetics, old roofs could only cause more trouble and hefty repair costs. That’s because leaks can get out of hand, causing water damage anywhere in your home—in the attic, walls, ceiling, basement, etc. The whole project will take a bit of time. Check the two-week weather forecast in your area. 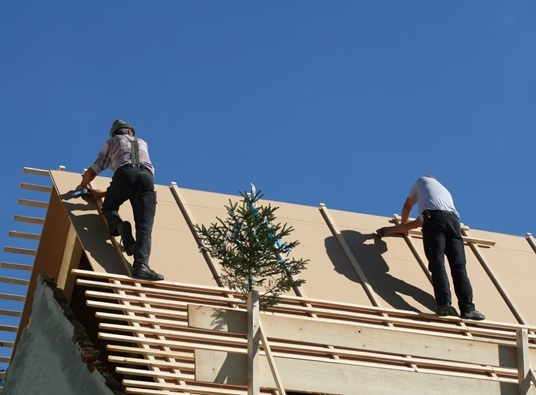 Schedule the roof replacement when the weather won’t be too much of problem that it would cause a delay in the project. There are numerous roofing materials available today, and each one has their own pros and cons. As one of the most trusted roofing companies in Michigan, Kroll Construction highly recommends asphalt shingles. It is actually one of the most popular roofing materials used today because it is an affordable option that offers beauty and performance. In a big home improvement investment, you have to make sure that the contractor you’re going to hire is trustworthy. Aside from licenses and insurance, you should check the contractor’s record through various reviews sites, such as the BBB and Angie’s List. You can also ask the contractor how long they have been in business and if they have certifications from trusted names in the industry. For all your roofing needs, Kroll Construction is the one you can certainly rely on. We have been in business since 1961, which means that for more than half a century, we have been providing Michigan residents with top-notch roofing products and services. We are also a certified contractor for top roofing manufacturers, including Owens Corning and IKO. We are not just a properly trained contractor, as we also offer quality products with industry-leading warranties. When you need a new roof, call Kroll Construction to make sure you get your roofing done with ease.